To help get this blog up and running, I’ll occasionally post more than once a week, at least for a short while. Despite being stunningly low-fi and tinny it’s still a unique document. Fantastically rhythmical. A great find. I am glad to have stumbled upon your site by accident. This is incredible… Magical beyond description. I’m not totally sure about the former French colonies of “Soudan” (today Mali) and Guinea to be one and the same. See http://en.wikipedia.org/wiki/French_Guinea and http://en.wikipedia.org/wiki/French_Sudan. 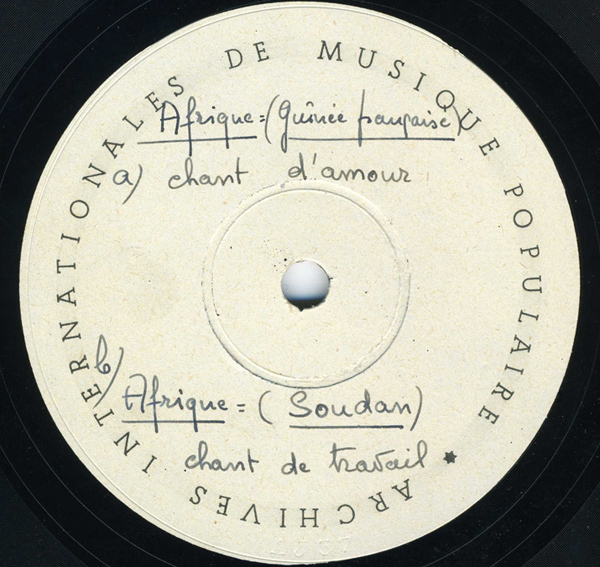 Therefore llooking closer at the label, I would say that on side A there is love song from Gnuinea-Conakry and on side B a work song (Chant de travail) from Mali.